Why does TITUS focus on national Christian workers? Read stories from Missionaries around the world! Training Nationals To Reach Their World—More than a slogan, this is the core of Titus' mission. Since our origin in 1984, we have been committed to the training and deployment of national Christian workers in foreign countries. Our methods of accomplishing that training and deployment have changed over the years, but not our commitment. Our early years (1984-91) were dedicated to producing video courses that missionaries could use to train nationals. We successfully did that, offering 15 video courses, with all the necessary resource materials for missionaries to set up Bible Institutes on their fields of service. Soon after the fall of communism in Eastern Europe, we entered a transition stage where Titus became a mission board, assisting field missionaries in going to foreign countries, with the same mission of training and deploying nationals within their own people-groups. Training them to reach their world, because it's Biblical. Training them to reach their world, because the Great Commission is equally given to all believers, in all churches, in all countries. Training them to reach their world, because our part is to facilitate, train, and assist nationals in any way needed and possible, plus teaching them to be trainers, and empowering them to lead their own work. This shared responsibility necessitates shared goals, plans, efforts, resources, and leadership authority to accomplish the task. 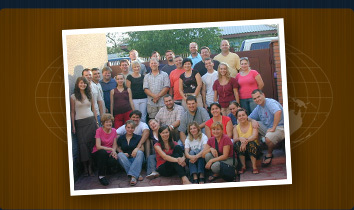 Our commitment to national workers dovetails with our commitment to traditional missionaries. We value and serve both, simultaneously. Consequently, the Titus Family includes traditional missionaries that share our vision for empowering and encouraging national workers. We are their (the nationals') co-laborers in God's plan to present His Son to the world. We are working in their (the nationals') fields, alongside of them. The Gospel of Jesus Christ is a message that God intends to have proclaimed to all people. The task of reaching every person cannot be fulfilled without a united, partnership effort of believers from every tribe, tongue, and nation. Fulfilling our world-wide commission is possible only with this kind of team effort. The world needs exponentially greater numbers of Christian missionaries from every nation of the world, not just the US. Titus is all about forming that team, in whatever country the Lord opens up for us. Now to the Great News For Titus Donors! I am so pleased to announce that we can now accept credit cards and checks online! Now you can support Titus International while shopping on Amazon.com through the Amazon Smile program! Now you can support Titus International while shopping from your favorite websites with Giving Assistant! If you have questions, please call our office at 423-867-7079, Monday/Wednesday/Friday, 8:30 a.m. - 4:30 p.m. Eastern time.